Here is recipe that I always fall back on for Sunday dinner. Super easy and fast! 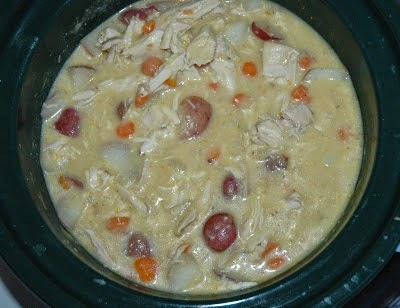 Mix all in crockpot and cook on high for 3 -4 hours or low for 6 - 8 hours. Before serving chop or shred chicken and mix back into soup. Mix and let stand for 15 minutes. Gradually add 3 1/3 c. flour. Dough will be kind of sticky. Let stand for 10 minutes. 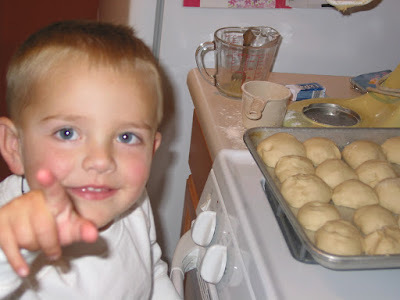 Spray hands with non-stick cooking spray and form dough into balls. Place on a cookie sheet. Let rise for 20 minutes. Bake at 375 for 10 minutes. Here is my little helper poking all the rolls! Thanks bud! The rolls aren't perfectly shaped, but no one has ever complained what they looked like since they are so yummy!